An Old Fool Rollin’ Old School. As parents we all know that kids ask a lot of questions. There is the old favorite “Are we there yet?” The question of where babies come from which leans more towards the frightening side and the tried and true “Why do I need to eat my vegetables?” that will most likely outlive all of us. There are, however, questions that as parents we love to answer. My daughters will sometimes ask what life was like when I was their age. They want to know if doorbells existed when I was a kid. They want to know what life was like before iPads and fun apps.They are truly curious as to what I did for fun. Once I realized that they might not be able to survive the course of a day without a tablet, I had to sit them down for a talk. We needed to work this whole thing out. I know each generation feels like theirs was the best, but I needed to drop some knowledge on these girls. I wanted to show them that growing up in the 1980’s wasn’t the same as the 1780’s and it was one of the BEST decades for a kid to ever experience. I would love to hear you try and tell me that the 80s weren’t, like, totally tubular. C’mon… this is the decade that brought us Pac-Man, the Walkman and the Speak & Spell. The 80’s gave us blockbuster hits like The Empire Strikes Back, E.T., and Raiders of the Lost Ark. What about the gnarly TV Shows like Masters of the Universe, Transformers, and Thundercats. And don’t even get me started on G.I. Joe and Knight Rider – we’ll be here all night. So I began slowly schoolin’ them on what it was like growing up in the greatest decade ever.. We showed them how to play classic video games like Q-Bert, Super Mario Bros, and Teenage Mutant Ninja Turtles. At first, they couldn’t grasp the concept that they couldn’t find any of their friends online and that they were actually forced to play against a live, breathing person that sat in the same room. However, they quickly began to enjoy the games that only had 2d graphics. After our short-lived console tour, we moved onto watching episodes of Masters of the Universe. They literally couldn’t stop laughing purely from the opening song for the show. After a few episodes, we took a break for lunch – but more importantly, for them to download everything they’d just experienced. 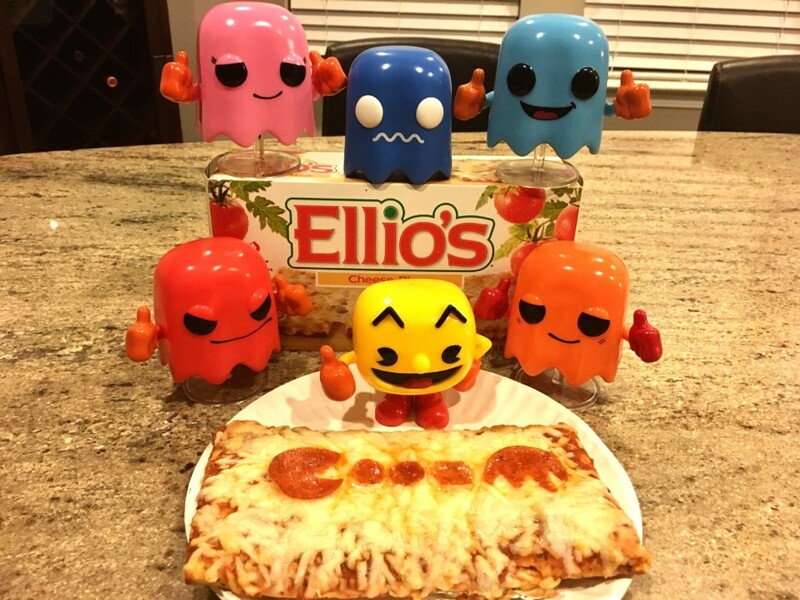 I told them that back in the 80’s, my mom and dad used to make my sisters and I one of the best pizzas out there – ELLIO’S. They used only the freshest ingredients, with 100% real cheese and no artificial flavors. When something comes in six different flavors (and two different styles), there’s enough to feed the entire family! Based off of their dumbfounded looks of confusion, I realized it was time for a mini-road trip to the store. On the way there, I told them how my parents would buy the plain cheese pizza from Ellio’s and allow us to add ANY of our favorite ingredients as toppings. The girls were totally psyched that they were going to experience the same lunch I used to eat when I was a kid. 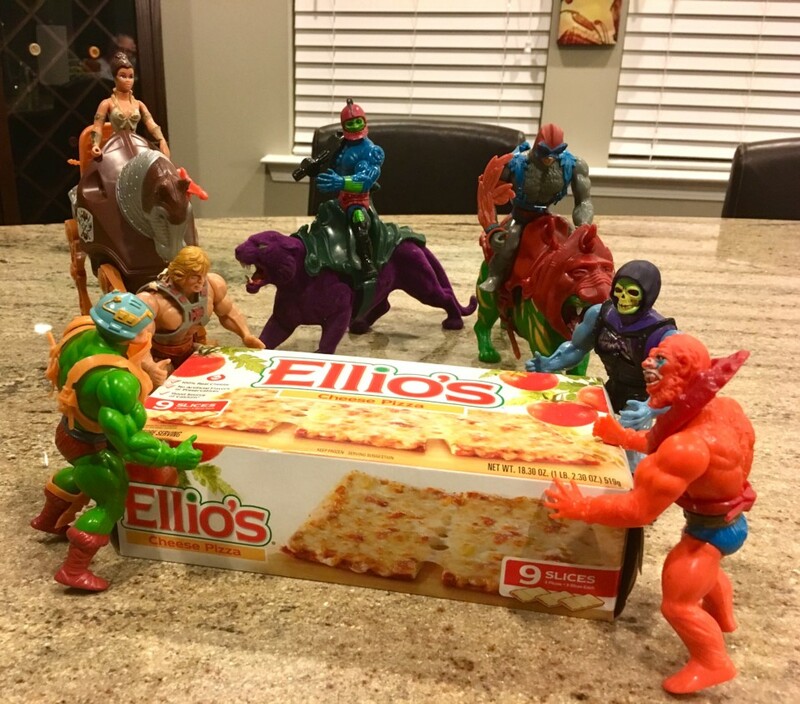 While cooking up a batch of Ellio’s Pizza, I continued waxing nostalgia to my kids about my childhood and what my friends and I did at parties. Perhaps they were indulging dear old dad, or maybe, just maybe they actually thought it sounded cool and asked if I might be down to pull off a throwback party to celebrate all my favorite childhood interests. What dad WOULDN’T think this was the best idea EVER? After selling the idea to my wife, we got some cool 80’s decorations and brought some neighbors over to kick it old school. 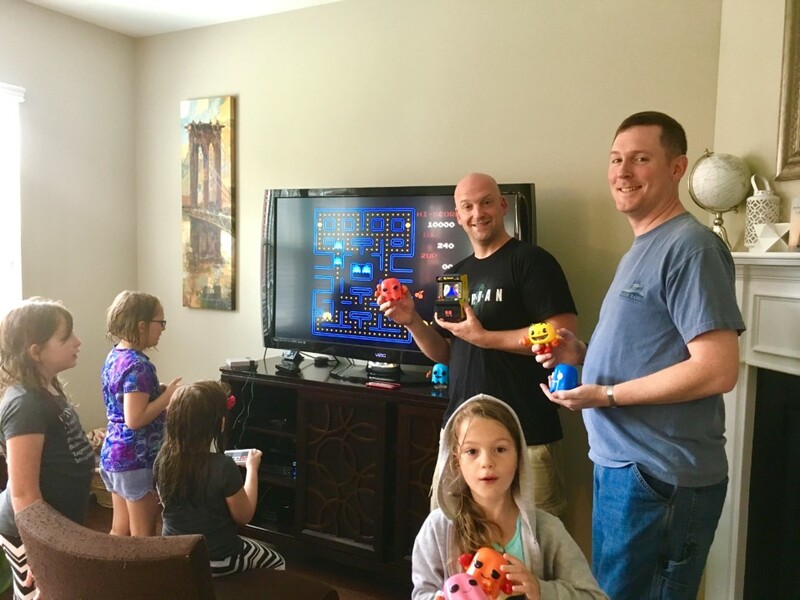 With consoles like Sega, Nintendo and Atari set up and the TV from the bedroom playing vintage cartoons on loop, we broke out a handful of board games and took a step back in time.I felt that my kids got to experience what it was like to grow up in the 80’s and nothing had felt better. The only thing missing was some sweet Swatch watches and a hot pair of Jordache Jeans. Thankfully Ellio’s Pizza has survived the test of time and is a brand that helped my daughters understand the 80’s just a little bit better. 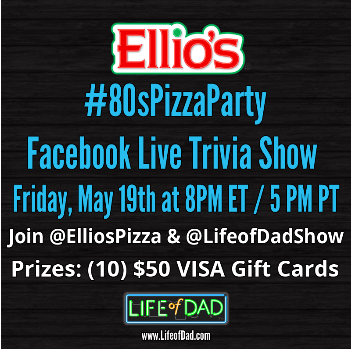 EXTRA BONUS: Please make sure to stop by LIFE OF DAD on Facebook this Friday at 8pm EST/ 5pm PST for a LIVE 80’s trivia show AND a shot at winning some cold hard cash (VISA GIFT CARDS). EDITOR’S NOTE: This was a sponsored post by Ellio’s Pizza and their #80sPizzaParty campaign, however, the nostaglic moments with my daughter’s are all mine. For more information on Ellio’s, check them out here , on Facebook, Twitter and Instagram.